Learn tap dancing from Bob Rizzo, Mike Minery, Rosemary Boross, Ginger de Paris, Lyn Cramer or Germaine Salsberg, Percussive tap, Hoofin', tot tap plus a tap dictionary. More Tap Dancing Videos on Tap 2 and Tap 3. Tap music CD on Tap 3. Intermediate Level with Eli Newsom. A perfect follow-up to Vol. 1, this DVD features more challenging steps, and takes you to the next level in tap dance. Steps like shuffles, drawbacks and buffalo are all fully explained and demonstrated by Eli from two different views. 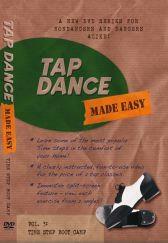 This is the perfect way to learn tap, and Eli devotes great attention to the proper energy and mood for each step. The twenty different exercises are all demonstrated with music. Steps taught in this DVD: Hop Shuffle Exercise, Carryback, Step Scuff Hop Exercise, Riffle, Back Flap, Rhythm Roll, Flam, Drawback, Buffalo Exercise (fast), Military Step, Paddle Speed Step, and a short combination. Music from this DVD available on the Tap Dance Made Easy CD. With Eli Newsom. The third release in this popular DVD series, Vol 3: Time Step Boot Camp combines clear instruction and a break-down of musical counts with a dual-angle view of the footwork to one of the most important and popular dance moves: the Time Step. Of the dozens of Time Step styles that exist, this DVD features some of the most well-known and most requested ones out there. While great for non-dancers and dancers alike, users of this DVD should at least be familiar with basic tap dance technique, which can be learned in both Volumes 1 & 2 of this DVD series, or in a live tap class. Included in this DVD: Stomp Time Steps, Shuffle Time Steps, Traveling Time Steps, and Cramp Roll Time Steps. Plus: Learn a Time Step Break, Dance a Time Step combination, and challenge yourself with a fun tempo building exercise! Music from this DVD available on the Tap Dance Made Easy CD. This music CD is divided into two sections: shorter songs, which are great to use for practicing the basics and center floor exercises, and longer songs, which are great for combinations or across the floor exercises. All of the shorter songs will repeat, usually four times or so, within each track. This allows you to repeat or reverse the step without having to go restart the track from the beginning each time. All songs have an intro, usually one count of eight, and tempos range between 80bpm and 170bpm. This CD contains the same songs used on all three volumes of the Tap Dance Made Easy instructional DVD series (all directly above). A dynamic fusion of hip hop, jazz and street dance, Derek Mitchell's choreography is slick and stylish. Learn three full length street jazz routines as Derek and his dancers teach you step-by-step each dance, slowly and clearly from the back. Derek's unique moves are tight, energetic and bursting with musicality. There's something for every level of dancer as the routines are choreographed for advanced beginner through advanced levels. Derek Mitchell teaches in New York City at Broadway Dance Center and Steps on Broadway. Derek has worked with Justin Timberlake and his dancers for Nickelodeon, Cameron Diaz, Hilary Swank, Britney Spears, JC Chasez, Kelis, Mary J. Blige and most notably Madonna and Missy Elliot's dancers in their Gap commercial. His dance classes have been profiled on numerous television shows and magazines, and he's won several choreography awards for his work. Join tap instructor Mark Goodman and learn three full length tap dances. Mark's enthusiastic and athletic style uses many swing inspired steps sure to have you gliding across the floor. No standing in place for this guy, as Mark's tap dances really move and use the space. His rhythm driven steps emphasize musicality and precision while his a cappella routine will challenge any advanced tapper. Mark's easy going personality and charisma will motivate and inspire you while his breakdown and explanations are both thorough and easy to follow. Mark Goodman has been fortunate enough to perform with the “greats” of the tap world: Savion Glover, Honi Coles, Buster Brown and the late, great Gregory Hines, to name a few. In addition, he danced with The American Tap Dance Orchestra with Brenda Bufalino. His theatrical credits include 42nd Street, No No Nanette, Sophisticated Ladies, Anything Goes, Joseph and the Amazing Technicolor Dreamcoat, and Sugar Babies. He also worked with Tom Hanks in the film Polar Express. Mark is on staff at The Performing Arts Center in LA and is Artistic Director of The Mark Goodman Tap Company. With Mark Goodman. In this follow-up to Mark’s first DVD for Beg/Int levels, this tape presents his tap material for the advanced tap dancer. Mark’s thorough approach and signature style make this tape easy to follow and fun to dance. What you’ll get on this DVD: Mark’s Advanced warm-up; advanced time steps; odd time signatures; tap tricks; basics of improvisation; and advanced pullbacks (including triples). Tap Technique for Beginner-Intermediate Levels. Join Mark Goodman and his tappers as they take you through the exercises and combos they use everyday to improve their Tap Technique! In this easy-to-navigate DVD, Mark presents sure-fire methods to improve any tapper, from adv/beg to intermediate levels. This DVD includes Mark's complete warm-up, All New Time Steps, Riffs, Across The Floor, Pullbacks and much more! Mark Goodman has performed with the "greats" of the Tap World: Gregory Hines, Savion Glover, Honi Coles to name just a few. He has performed solo at Carnegie Hall and appeared at The DelaCorte Theatre in NYC with "Savion Glover and Friends." Mark has tap danced in the Miss California Pageant and appeared in the movie "The Polar Express" with Tom Hanks. He choreographs and teaches all over the globe, including Finland, Australia, New Zealand and Guatemala. Some of his famous tap clients include TV stars Eileen Davidson and Harry Hamlin. He has his own company in L.A., The Mark Goodman Tap Company, allowing him to showcase his own unique brand of tap in such original shows as "Seal With A Kiss" based on the music of Seal, and "Red", an adaptation of "The Red Shoes". We hope you have your energy drink at hand, because Gregg Russell is ready to tap! This DVD contains a warm-up and three diverse and unique routines (including a signature acappella dance) for the intermediate to advanced tapper. Gregg's "outside the box" approach expands the traditional style of tapping while keeping the respect it deserves. You'll get hours of steps and rhythms to work on, along with laughter and entertainment. Gregg is an Emmy nominated choreographer, who's credits include a commercial for Carvel Ice Cream and choreographer for the CBS soap opera “Bold and the Beautiful”. He danced in the new Jason Mraz video “You and I”, and kicked up his heels in a Gap commercial. He was also a guest performer and choreographer on the Disney show “Even Stevens” and “Buffy the Vampire Slayer”. Movie credits include “Newsies”, “Cats Don't Dance” and “Clueless”, and as a guest on the show “3rd Rock from the Sun”. His talents also include coaching stars such as Cedric the Entertainer, Bette Midler, and ice skater, Ilia Kulik! Gregg currently teaches at Edge Performing Arts in Hollywood. Music for this DVD can be found on the Hi-NRG CD . Contains the music for Gregg's warm-up and routines on the Hi-NRG Tap DVD directly above. Tapology with Marsha Pitt is a unique five-step instructional tap dancing program. It pairs the teaching of classic tap dancing skills with a Rhythm and Blues sound for an updated, and contemporary spin on this timeless art form. This program provides one-on-one instruction on the most basic tap dancing techniques including brushes, hops, shuffles, leaps and steps. It is designed for people of all ages, from beginner level to the more advanced level, who want to learn how to Tap Dance in the comfort of their own home. Included in this program for the more advanced dancers is the full version of Peek a Boo, a song written and performed by Marsha Pitt. All of the R&B inspired music on this DVD are original compositions created especially for Tapology. Marsha Pitt, whose career started at age 5 is an accomplished dancer, actress and teacher. She was an original cast member of Disney's The Lion King and has instructed many workshops and dance classes. Easy to learn step-by-step tap progressions! Beginner thru advanced levels! Glide easily from a waltz clog to a wing as Jimmy Kichler weaves basic variations into dynamic advanced progressions. Enjoy over 30 variations which guide the student from fundamental steps to intricate footwork and rhythms. Join Jimmy and his demonstrators as he offers original progressions that are useful to the beginning student as well as the passionate professional. Jimmy Kichler, a leading tap instructor in New York City, teaches at STEPS on Broadway. Among his students are performers from Broadway, Television and Film. Master classes and workshops have taken him around the globe as has his work as a choreographer and performer. His tapping tones can be heard on the tap track on the Electra Nonesuch CD, Strike Up The Band. Producer Bob Rizzo has combined two popular tap instruction videos with Charles Kelley onto one DVD! Turns For Tap: From simple step turns to Barrel-roll and Windmill, legendary instructor Charles Kelley spins up a storm for every tapper, beginner to advanced levels. There is something for everyone; traveling, circling and spot combinations, as well as a few "specialty" turns for those more advanced routines. Tappin' Rhythm: Ready for more? It must be time for the "time step dictionary," Charles Kelley's fast paced collection of over 50 times steps, breaks and combinations! Don't worry, the steps are taught from both front and rear views making it easy to follow along for all dancers, beginner to advanced. With Keith Clifton. Rhythmic, percussive, and fun! Feel the beat as Keith Clifton leads you through inspiring routines that combine innovative phrasing, classic tap and the unique “Clifton” edge. Keith's background as a musician infuses this class with rockin' rhythms and fast footwork designed for the intermediate and advanced tap dancer. Learn several warm-up steps, variations, and two full-length routines, demonstrated from both front and rear views. Keith Clifton is an acclaimed dancer, teacher and choreographer based in Los Angeles. His work includes commercials for Dr. Pepper, Wendy's, Dodge, McDonald's and Levis Jeans. As a musician, Keith composes his own music and currently performs with the Clifton Drum Tap Trio. Music from this DVD is available on the Full Metal Tap CD below. Contains the music for Keith Clifton's routines on the Full Metal Tap DVD above. Warning! This video will inspire you to start tapping immediately. Gregg is ready for round 2 and not holding back any punches on TOTAL TAP. He shares with you an out of the box approach to everyday basics along with helpful hints on some of the trickiest steps today. This includes over 25 variations on pullbacks, wings, split tricks and much more. So go get your tap shoes, because the game is about to start & the the future of tap will never be the same. Gregg Russell is an Emmy nominated choreographer who was a guest performer and choreographer on the Disney show “Even Stevens”, “Buffy the Vampire Slayer” and “Third Rock From The Sun”. He danced in the films “Newsies” and “Clueless” and in commercials for The GAP. Gregg has also performed with such recording artists as Sugar Ray, Smash Mouth and Reba McIntyre. He currently teaches at Edge Performing Arts in Hollywood, and has formed an L.A tap club, TapSounds Underground. Popular Tap instructor Gregg Russell takes traditional tap steps and remixes them into his own unique, cutting edge style. Learn his warm-up, original variations, counter rhythms and an extended, long-play routine danced by Gregg and his partner Ryan Lohoff. Burn the floor with this percussive, innovative and coolly creative choreography! All steps taught slowly from the back for easy learning. Experience the precision and pizzazz of Mike Minery from NYC as he shares with you his explosive, new Tap style! He'll teach you his snappy warm-up, percussive variations, and tap tricks with a twist. Finally, you'll put it all together with a hoofin' routine that will burn the floor. C'mon 'n Shiggy Bop along with Mike! Mike Minery has established himself as one of the finest tap dancers working today. He combines youthful power with the finesse of the old time hoofers. He teaches weekly at the Broadway Dance Center in NYC, and has performed throughout the world with the acclaimed Manhattan Tap. Michael can also be seen hoofin' on Broadway with his Tap act at the famous Supper Club. Music for this video available on the Music Jam CD Vol. 1. Take off with Tap sensation Mike Minery and learn his signature style Acappella Tap choreography! The steps explode off the screen and onto your feet as Mike and his dynamic dancers perform a complete and intricate production number filled with cannons, counter rhythms, partial rhythms, and improvisation - all without music. Mike then breaks down each step, shown from the back with both counts and the names of the steps for easy learning. The material is fresh, cutting edge and ideal for students, choreographers, and tap aficionados alike! Acappella means to dance or sing without musical accompaniment! Mike's first video, HOOFIN", was an instant bestseller and continues to inspire tap dancers worldwide. Now, he's back to teach his much acclaimed, trend setting tap routines. Mike's dances sizzle with polish and are jam packed with enough material for years to come. Designed for intermediate and advanced dancers, an extensive vocabulary of footwork includes Over the tops, 5 count shuffles, Slides, Wings, and the infamous Minery "Shiggy Bop". All the choreography is demonstrated from front and back views for easy learning. See also the Music Jam CD Vol. 2 that contains the music for this video! Tot Tap with teacher Rosemary Boross is a fun-filled introduction to the world of tap dance for children. It is a beginner class designed for children ages four through six, teaching the basics of tap, including toe taps, heel taps, shuffles, cramp rolls and more. The delightful music helps the children hear the rhythms and execute them clearly and easily. If you hate to exercise but want a fun way to stay in shape, then join Bonnie Franklin and begin to tap. In this challenging video for all ages you will learn to tap at your own pace, step by step. Bonnie Franklin teaches you all the basic steps, how to build combinations and dance popular tap routines such as The Waltz Clog, The Soft Shoe and The Time Step, plus more. Bonnie Franklin has tapped since she was 9 and began teaching at the age of 12. Also, check out our Jazz, Ballet or view all our Dance Videos. Recommend this Instructional Tap Dancing Video page to a friend.